Too bad most of our "math reading" is with dry, unfriendly textbooks in school. It turns out there are lots of extremely well-written math books (not textbooks) that are addictive and fascinating reads. They usually cover the more personal side of math, including the solution or history of famous math problems, the lives of mathematicians, their struggles, their genius, and the math they created. Plenty of these readable math books also cover slightly more technical topics and are a great gentle introduction before hitting the serious, less-friendly books. Fermat's Enigma Easy & addictive account of 350 year journey to proof of Fermat's Last Theorem. On Amazon Singh No math past high school needed. Effortlessly learn math topics along the way, but only if you feel like it. The World of Mathematics: A Four-Volume Set A gathering of the best essays and book excerpts on all fields of mathematics, written by giants like von Neumann, Schroedinger, and Turing. On Amazon Newman (Editor) Read, re-read, highlight, dog-ear this book. Get fascinated by every article from "How to Hunt a Submarine" to "The Absent-minded Genius and the Laws of Chance" to "Heredity and the Quantum Theory." Men of Mathematics A famous math author's thorough, super engaging but not entirely historically accurate account of the lives of some of the biggest names in mathematics history. On Amazon E.T. Bell The book John Nash Jr. (A Beautiful Mind) read as a child that began a serious, life-long passion for mathematics. Less than 10 years after reading this, he wrote his Nobel Prize winning Ph.D thesis. The Princeton Guide to Mathematics Incredibly well-written encyclopedia of math subject overviews, math topics, theorems, mathematicians, etc. On Amazon Gowers (Editor) Mysteriously pulls off being lucid and technical at the same time. Each article is by an eminent mathematician in that field. 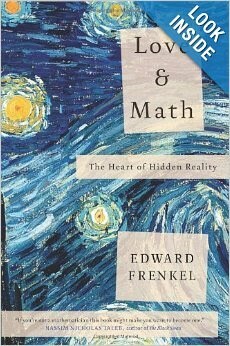 Everyone from high schoolers to professional mathematicians get a lot out of this book. Google for lots of free PDF excerpts. The Einstein Theory of Relativity Illustrated, in verse. Learn tensors, coordinate maps, special and general relativity. On Amazon Lieber Originally published shortly after the theory's creation. Easily get sucked into it and read 40 pages before you know what's happened. Mathematics: Its Content, Methods and Meaning An expository overview of all major fields of mathematics, over 1,000 pages. The Dover edition on Amazon A. D. Aleksandrov, A. N. Kolmogorov, M. A. Lavrent'ev Akin toa Princeton Companion to Mathematics from the 1960s. Science and Hypothesis On Amazon Poincare Learn insights about mathematical creativity directly from a genius. How To Solve It: A New Aspect of Mathematical Method A classic in how to solve mathematical problems. On Amazon Polya Advice for how to solve problems in a very general but very practical sense. The Last Problem A look at Fermat's Last Theorem, but written before the problem was solved. By an extremely influential math author of yesteryear. Read about it on Amazon E. T. Bell This is the book Andrew Wiles read as a child that instantly hooked him on the lifelong dream to solve Fermat's Last Theorem, a feat he accomplished in 1994.